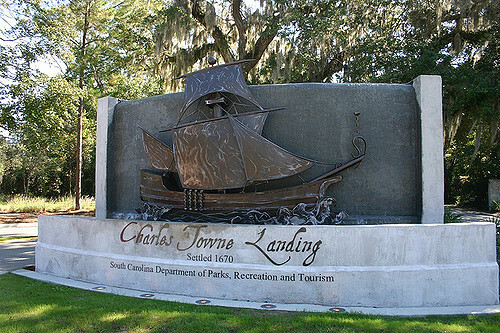 Friday, January 25, 2019 Nic Butler, Ph.D.
Charles Town, the first permanent European settlement in South Carolina, was established in April 1670 on the west bank of the Ashley River at a place called Albemarle Point (now part of Charles Towne Landing State Historic Site). Surviving letters from those first settlers inform us that they commenced building fortifications, made of earth and wood, almost immediately after their arrival. The Spanish government claimed this ground as the northernmost part of Florida, and political tensions with our neighbors in St. Augustine remained high throughout the early years of English settlement. Although the nations of Spain and England were technically at peace during the first three decades of the Carolina colony’s existence, the early settlers here harbored considerable and legitimate anxieties about the threat of a Spanish invasion. Unfortunately, we know precious little about the fortifications constructed at Albemarle Point in the 1670s because the early settlers kept very scanty records of their activities. Archaeologists working at Charles Towne Landing in recent years have found some physical evidence of those early works, but additional physical investigation is needed to tell the real story of the earliest English fortifications in South Carolina. While settlers were building a small town at Albemarle Point in the 1670s, the outline of a new town was laid out in 1672 on the peninsula known as Oyster Point, at the confluence of the Ashley and Cooper Rivers. Over the next several years, inhabitants and newcomers began drifting increasingly to the new town site. Local representatives communicated to the Lords Proprietors of Carolina in England that the people here generally preferred the site at Oyster Point, and in December 1679 the Proprietors gave their consent to a relocation of Carolina’s sole town and seat of government. The peninsular settlement known as Oyster Point officially became “new” Charles Town in the spring of 1680. While that date marks an import point in the cultural history of South Carolina, it also stands as the beginning of a period of lamentable archival silence. Between the removal of the political capital from Albemarle Point to Oyster Point in 1680 and the restructuring of the South Carolina General Assembly in 1692, there are no surviving legislative records. The early Grand Council of Carolina continued to meet, to make laws, and to engage in various political machinations, but written details of (most of) their activities between 1680 and 1692 disappeared long ago. In light of this documentary chasm, we have very little record of how the new town developed, and very little insight into the construction of the new town’s earliest fortifications. We have to look for scraps of information in other sources, like private letters written between Charles Town and the world beyond Carolina. In May of 1680, for example, an early inhabitant of Charles Town named Maurice Mathews wrote an enthusiastic letter to a friend who had just arrived aboard a ship anchored in the harbor. Mathews described the plans for the new town in optimistic detail, and stated that the settlers intended very soon to commence building works to defend the peninsular site of new Charles Town: “Wee are to make fortifications when wee have brought our great guns from the old town whereby wee shall be able to deale with the greatest force of ane enemy that can on a sudden come upon us from [the] sea.” In the ensuing weeks, months, and years, however, there are precious few surviving documents to inform us what sort of fortifications—if any—were actually built, and when and where the cannon were mounted. In fact, the surviving evidence seems to indicate that the people of Charles Town in the 1680s continued to pursue various private interests while ignoring their collective defense. Houses were built, trade networks were established, and plantations carved out of the native wilderness. News of a Spanish force supposedly marching toward Charles Town in August 1682 inspired the Grand Council of South Carolina to order the immediate removal of twenty cannon from the “place where the town was first designed to be made” to the new town. When that intelligence proved false, however, the inhabitants of Charles Town returned to their private interests and, for the remainder of the decade, ignored their defensive needs. The false alarm of 1682 apparently spurred the local government to transport eleven cannon (not twenty) from Albemarle Point to the new town site on Oyster Point, but those iron tubes apparently languished in the sand for more than a decade. It took an act of the legislature in January 1694/5 to get the eleven guns then present in town mounted on proper carriages and made serviceable for use in the event of an attack. Let me say that again, I have not found any document to suggest that there were any cannon mounted in urban Charles Town prior to the spring of 1695. Yes, the provincial government of South Carolina had approximately two dozen cannon in its possession during that time, but those weapons either languished on rotting wooden carriages at Albemarle Point or they lay in the sand for the first fifteen years of the new town. In April of 1684, the Lords Proprietors of Carolina appointed Sir Richard Kyrle to be governor of the colony and handed him a list of objectives for his administration. Prior to Sir Richard’s departure from England, the Proprietors instructed him to convince the Grand Council of Carolina to “put the place into ye best posture of defence you can.” England and her colonies were technically at peace at that time, but the so-called “War of the Reunions” (1683–84) between France and Spain at that moment threated to impact England’s southernmost colony in North America. Spanish or French privateers might venture into neutral Charles Town for reasons legal or otherwise, the Lords Proprietors warned, and so the people of that port town needed to be on guard. A few months later, in June of 1684, the Proprietors impatiently wrote to Governor Kyrle in Charles Town and asked to be informed of his progress at his first opportunity. Unfortunately, Sir Richard died in September 1684 without having submitted a report on the defenses of Carolina. While we lack documentary specifics related to the state of Charles Town’s defenses in the mid-1680s, other evidence enables us to surmise that the early settlers had done little to prepare themselves during the first five years of that decade. Six months after the death of Governor Kyrle, in March of 1684/5, the Lords Proprietors in England expressed their belief that the new peninsular location of Charles Town was in fact a poor site for the seat of the Carolina government. Based on information they had received from settlers on the ground here, the Proprietors were of the opinion that the town was “so near the sea” that it might inspire hostile ships to raid Charles Town, and that the nascent town was “so open [that is, undefended,] that a few men may surprise the governor[,] councell & parliament in their bedds.” The Proprietors recommended moving the seat of government inland, away from the naked coastline, but those early CharlesTownians didn’t budge. 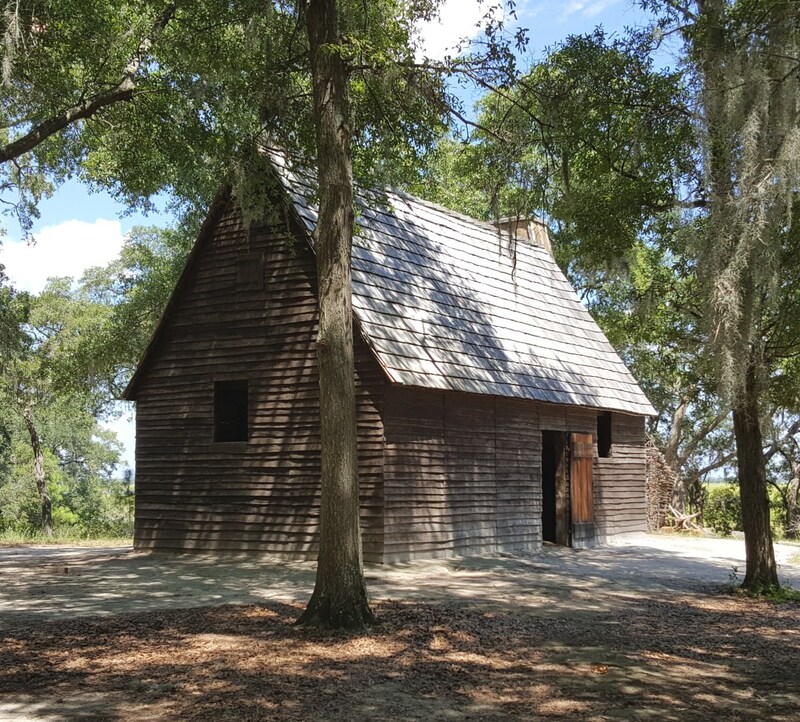 In November 1685, the Grand Council of Carolina ratified an act to strengthen the militia and to erect a “tight” watch house on Sullivan’s Island, James Island, and near Port Royal, but they did nothing to defend the capital of Carolina. A few months later, in April of 1686, a young Frenchman of Scots ancestry named Jean Boyd sailed into the harbor of Charles Town with a group of other Huguenots who fled from religious persecution in France. After a few weeks of exploring his new home and its environs, Boyd put pen to paper and wrote a long and colorful letter to his family back in Europe. Among the highlights of this fascinating letter, the entirety of which appeared in the Transactions of the Huguenot Society of South Carolina in 2006, are a series of watercolor illustrations that depict several curious plants found in the Lowcountry of South Carolina. Of particular interest to me, however, is a hand-drawn map that appears on the first page of Boyd’s letter to his family. The “Boyd map,” as we might call it, is a small pen-and-ink sketch on laid paper, brightened with a bit of color wash, that was created by an amateur artist to illustrate an informal description of Charles Town. As such, it was never intended to serve as an authoritative cartographic representation of the geography and topography of the early town. It is a curious, imperfect little document, drawn without a consistent sense of scale, but its historical value is great. It provides the earliest known depiction of the settlement of “new” Charles Town, which was officially removed from Albemarle Point to Oyster Point in 1680. The artist did not include a date on his map, but several internal and external clues inform us that Jean Boyd created it shortly after his arrival in Charles Town in the spring of 1686. At some point in the late seventeenth century, Boyd’s letter, which is written entirely in French, was sent to an English-speaking reader who inscribed the date “1691” above the map and thus created a bit of chronological confusion. The letter and its hand-drawn map are now part of the Special Collections at the library of the University of Aberdeen, and, with the generous permission of that institution, I am including a digital scan of Jean Boyd’s 1686 map along with this essay. The Boyd map depicts the southernmost part of a peninsula or neck of land lying at the confluence of the Cooper and Ashley Rivers. It shows a small settlement consisting of eight streets of different sizes, running along parallel and perpendicular lines, none of which are identified by name. It is tempting to identify the widest street, oriented perpendicular to the Cooper River waterfront, as Broad Street, alias Cooper Street, which was the principal street in the plan of the town and the only one formally named in the surviving government records of late seventeenth century South Carolina. The map’s lack of a uniform scale and its odd arrangement of streets precludes a definite identification, however. Nevertheless, I believe it makes sense to interpret the broadest street in the map as our modern Broad Street, so I’ll use that designation for the rest of this discussion. The bottom left corner of the Boyd map includes a key that identifies several important features on the map, which includes two small forts that are connected by a defensive wall. Owing to the lack of legislative records from the 1680s, the details of when and how these fortifications were built is a complete and utter mystery today. Jean Boyd’s little map provides the only known evidence of what he described as “first fort and place of justice” (letter A), located at the east end of what appears to be Broad Street, and a “Second Fort” (letter B) that stands a bit further to the south. These two features are connected by a long, narrow line described as a “tranchée” (letter C), that boarders the “quay” (letter D) along the west bank of the Cooper River. According to Boyd’s illustration, the “first fort” at the east end of Broad Street is slightly broader than that street, which was laid out to be sixty-six feet wide. The precise dimensions of the fort are unknown, but Boyd’s drawing suggests it encompassed a considerable area and probably functioned as an important public gathering place (hence the gallows depicted to the right of the letter “A,” and the term “place of justice”). Boyd’s description of this structure as the “first fort” implies that it was the first built, and its placement at the center of the new town’s waterfront tends to support this theory. The slightly smaller “Second fort” is situated at the southern end of the town’s waterfront, on a spot that represents the southernmost point of high land on the west bank of the Cooper River. In the vocabulary of military engineering during Boyd’s era, both the first and second forts appear to be a sort of modified “horn-work.” On their east sides, facing the Cooper River, each fort has a pair of horn-like half-bastions, the north and south flanks of which are perpendicular to the front line. The straight line across the front of each fort, called a curtain line, is interrupted by a small semi-circular or “half-moon” projection in the center of the line. Collectively these features are designed to maximize the number of angles from which defenders might fire weapons at approaching enemies. The back or west side of the first fort is open to Broad Street, while its northwest and southwest flanks each terminate in a diamond-shaped full bastion. Because its back side is open, this “fort” is technically a “battery,” but we can forgive Jean Boyd for ignoring this subtle distinction. A close examination of the interior of the “first fort” appears to reveal a series of dots in a sort of diagonal line. These dots might represent a palisade wall of some kind, or perhaps a moveable gate that controlled access to the fort’s interior. It’s also possible, however, that these dots simply represent the artist’s tentative efforts to sketch the shape of the fort hastily with permanent, unforgiving ink. In a similar but more logical fashion, the west side of the second fort appears to be enclosed by a slightly elliptical curtain line made of palisades, which is represented by a series of dots. While the overall design of these two forts might seem somewhat irregular by the textbook standards of European military architecture, I believe they reflect the work of an unknown party or parties who were familiar with the basic geometry of contemporary fortification design. Among the core principals of late-seventeenth-century military architecture, as practiced by such luminary figures as Sébastien de Vauban (1633–1707) are the following important considerations: The designer of fortifications must adapt his design to suit the topography and geography at hand. He must endeavor to make the best use of available resources, whether that be stone, brick, wood, or earth. Finally, the physical scale and monetary cost of the fortifications should be commensurate with expectations of their endurance. That is to say, small inexpensive fortifications are suitable for temporary defensive needs, while larger, more permanent works reflect the long-term commitment of resources in response to a sustained need for defense. 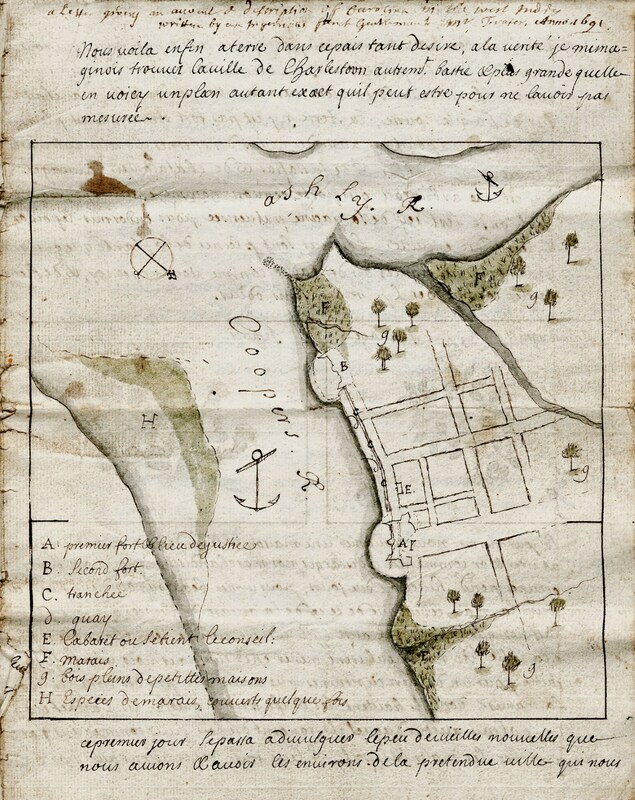 Jean Boyd’s 1686 letter does not describe the materials used to build the waterfront fortifications of early Charles Town, but the relatively simple and diminutive works depicted in his hand-drawn map early were likely constructed entirely of timber and earth. The coastal areas of South Carolina are devoid of stone, and hand-made bricks were in short supply in the colony’s early decades. The construction of the defensive works depicted in this map would have been relatively cheap and simple, with the labor to procure the wood and dig the earth being the greatest expense. It would be unrealistic for us to believe that the earliest settlers of Charles Town would even consider investing vast sums of money to build large, permanent fortifications during the initial process of clearing a little town out of the native forest. Such major public works projects came later. 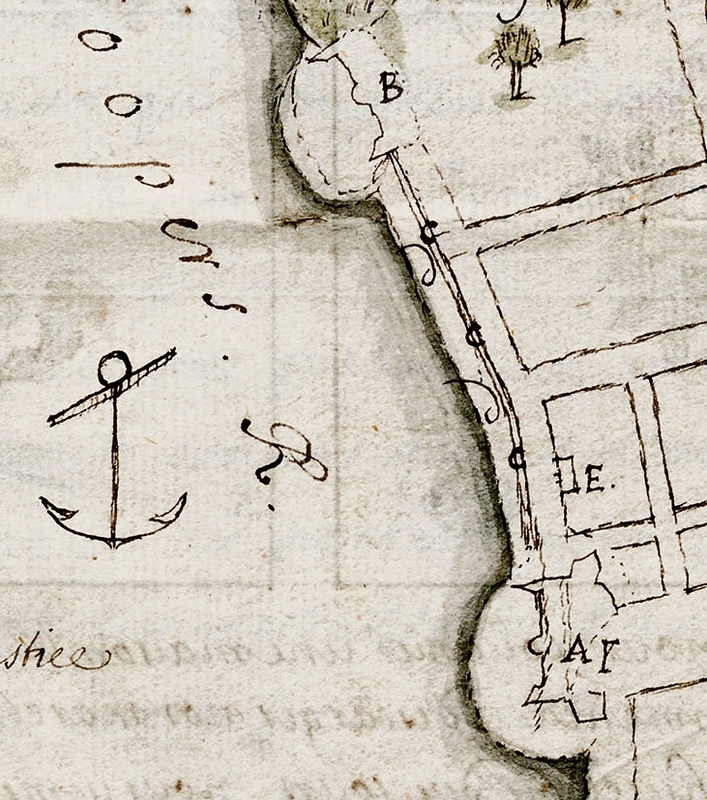 Boyd’s map also identifies a “tranchée” standing behind (to the west of) the “quay” or wharf. While it is tempting to translate “tranchée” literally as “trench,” a more historically appropriate translation is “entrenchment,” an antique military term that describes a defensive wall or berm made of excavated earth. These two features form the town’s waterfront, and appear to link the two forts at its north and south ends. According to Maurice Mathews’s 1680 description of new Charles Town, the first inhabitants laid out “60 foot for a publick wharfe” along the banks of the Cooper River, and thus Boyd’s “tranchée” appears to bisect the full width of the wharf (now called East Bay Street). The purpose of this entrenchment was probably two-fold: to prevent the flooding of the town during storms and to provide added defensive protection against potential invaders. It is noteworthy that each of the two forts depicted in the 1686 Boyd map is located within (or to the west of) an area that we might describe as having a roughly half-moon shape. These features might represent a pair of man-made breastworks, constructed of wooden pilings driven into the mud to protect the forts from storms and abnormally high tides, or they might simply represent natural-occurring projections of dry land that the settlers adapted to suit their defensive purposes. In fact, these half-moon features might represent a sort of combination of these possibilities; that is, naturally-occurring features that the settlers augmented with wooden pilings. Without further documentary evidence, however, we might never know the real story behind these curious features. The Boyd map is a historic record of unquestionable value, but it offers no clue to the genesis of the fortifications depicted along the waterfront of Charles Town in 1686. The town began growing in earnest after the removal from Albemarle Point to Oyster point in the spring of 1680, and it’s possible that the defensive works Boyd observed were constructed several years prior to his arrival. We don’t have any exact population statistics from this era, but a few settlers remarked on the growth of Charles Town during its first decade. One Englishman remarked that the town had grown from just three houses at the beginning of 1680 to about 100 by May 1682, and a Frenchman described Charles Town in 1690 as containing about 300 houses. Despite the anxieties about possible Spanish and French incursions in 1682 and 1684 that I mentioned earlier, England and her American colonies enjoyed a period of relative calm during the early 1680s. The inhabitants of South Carolina did not experience any significant alarms or emergencies during those years that might have triggered the rapid construction of temporary fortifications. Not only are we clueless about the genesis of these works, the earliest fortifications in Charles Town, but I haven’t yet found any documentary reference to their removal or demolition. In light of these facts, here’s my best attempt at a simple conclusion about the rise and fall of the early works depicted in the Boyd map of 1686: I believe they were constructed hastily, but with some planning, shortly after the town at Oyster Point became new Charles Town in 1680, and were subsequently neglected and allowed to crumble over the ensuing decade. The townsfolk probably didn’t have to demolish those rude fortifications so much as sweep away their remnants as the town’s infrastructure gradually matured and improved. A decade after the creation of Boyd’s map and letter, in the late 1690s, the revitalized South Carolina General Assembly began enacting a series of laws to fund the construction of a network of permanent and substantial brick fortifications along the length of the eastern waterfront of Charles Town. In late 1703, the Assembly further voted to expand the town’s fortifications by building additional earthen entrenchments and bastions to enclose the south, west, and north parts of Charles Town within a system of interconnected walls and moats. Fortunately for the modern researcher, the expansion of the town’s defensive works in the 1690s and beyond is relatively well-documented in the surviving historical records, and can be traced with some confidence. Without Jean Boyd’s hand-drawn map, however, the earliest efforts to construct protective fortifications at “new” Charles Town would remain an impenetrable mystery forever. For details about the Spanish claim to South Carolina, see Herbert E. Bolton, ed., Arredondo’s Historical Proof of Spain’s Title to Georgia. A Contribution to the History of One of the Spanish Borderlands (Berkeley: University of California Press, 1925), which is available online at the website of the Hathi Trust. For an account of the early settlement at Albemarle Point, see Langdon Cheves, ed., “The Shaftesbury Papers and Other Records Relating to Carolina and the First Settlement on Ashley River Prior to the Year 1676,” in Collections of the South Carolina Historical Society, Volume 5 (Charleston: South Carolina Historical Society, 1897; reprint; Charleston: Tempus Publishing, 2000). Matthew Lockhart, “Quitting More Than Port Royal: A Political Interpretation of the Siting and Development of Charles Town, South Carolina, 1660-1680,” Southeastern Geographer 43 (November 2003): 208. Samuel G. Stoney, ed., “A Contemporary view of Carolina in 1680,” South Carolina Historical Magazine 55 (July 1954): 153–54. The original source of this item is a “Coppie of a Letter from Charles Towne in Carolina,” located at Edinburgh University Library, Special Collections, Laing Collection, La. II, 718/1. Letter from Thomas Newe to his father, dated 23 August 1682, in Alexander S. Salley Jr., ed., Narratives of Early Carolina 1650–1708 (New York: Charles Scribner’s Sons, 1911), 185–86. Act No. 113, “An Act for the raising of a Publick Store of Powder for the defence of this Province,” ratified on 17 January 1694/5, in Thomas Cooper, ed., The Statutes at Large of South Carolina, volume 2 (Columbia, A. S. Johnston, 1837), 82–84. Lords Proprietors to Governor Sir Richard Kyrle, 29 April and 3 June 1684, in A. S. Salley Jr., indexer, Records in the British Public Record Office Relating to South Carolina 1663–1684 (Atlanta: Foote and Davies for the Historical Commission of South Carolina, 1928), 279–80, 287–94. Lords Proprietors to the governor of Carolina, 13 March 1684/5, in A. S. Salley Jr., indexer, Records in the British Public Record Office Relating to South Carolina 1685–1690 (Atlanta: Foote and Davies for the Historical Commission of South Carolina, 1929), 31–40. Act No. 27: “An Act for the better security of that parte of the Province of Carolina, that lyeth Southward and Westward of Cape Feare, against any hostile invasions and attempts by Sea or Land, which the neighbouring Spaniard or other enemy may make upon the same,” ratified on 23 November 1685, in Thomas Cooper, ed., The Statutes at Large of South Carolina, volume 2 (Columbia, A. S. Johnston, 1837), 2: 9–13. A reproduction of Jean Boyd’s letter and map can be found in Harriott Cheves Leland and Dianne W. Ressinger, “’Ce Païs Tant Désiré’: ‘This Much Longed-For Country,’” Transactions of the Huguenot Society of South Carolina, 110 (2006): 1–41. The original document is held by University of Aberdeen, Special Collections, MS 3952/9. A description of the rationale for the 1686 date is also found in Harriott Cheves Leland, “It All Started with a Sketch/Map,” Transactions of the Huguenot Society of South Carolina 112 (2008), 37–40. Stoney, ed., “A Contemporary view of Carolina in 1680,” 154. Salley, Narratives of Early Carolina, 181; Robert Cohen and Myrian Yarndeni, “Un Suisse en Caroline du Sud à la fin du VIIe Siècle,” Bulletin de la Sociéte de l’Histoire du Protestantisme Français 134 (January–March 1988): 61–71. A shorter version of this essay appeared in Transactions of the Huguenot Society of South Carolina 112 (2008): 40–43.